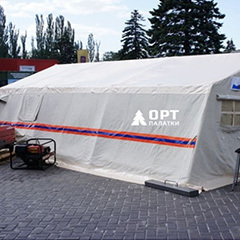 ORT is one of the preeminent military tents suppliers across the globe. 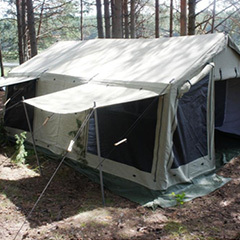 We manufacture quality assured and high performance range of army tents. These army camping tents contains water proof facility that provides better protection in case of rains. 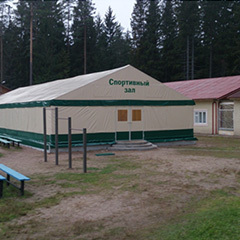 With Russian military tent having designs and patterns as preferred by the army, our company develops and manufactures the most preferred choice available in the market. 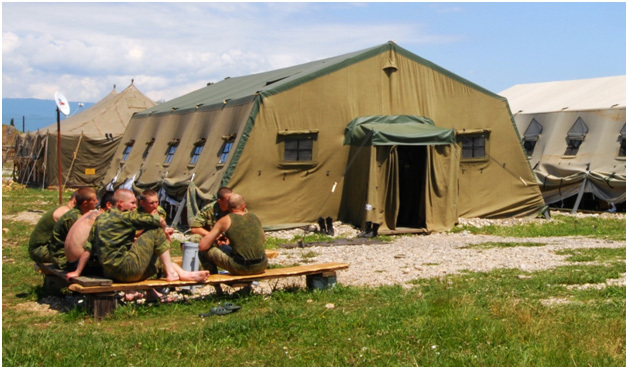 We manufacture these army tents in various dimensions and ranges as mentioned below. 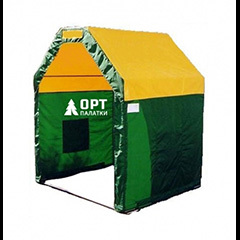 In addition, we can also develop customized tents as per required specifications. We manufactured Ten-place tent M10 for all-season living in the field. Steel frame from profile pipes withstands snow load up to 140 kg / m², wind power - 48 kg / m². When using a stove or a heat gun connected through a sewed air duct, the tent can be used as a living room at temperatures as low as -50?C. External awning combined: the top of a sealed fabric with a double covering of PVC, the walls of a "breathable" half-linen canvas. Internal awning made of washable fabric. The chimney hatch is equipped with a steel sheet. The windows have mosquito nets and are equipped with removable filling from Plexiglas.